Father Steven Harris, pastor of St. Bridget Parish in Philadelphia’s East Falls section, has been placed on administrative leave because of “concerns that arose regarding his suitability for ministry,” according to a Dec. 22 statement from the Archdiocese of Philadelphia. The archdiocese’s “Standards of Ministerial Behavior and Boundaries” outline behavior expected of priests, deacons and lay staff and volunteers not only regarding interactions with children but with adults as well. A report of possible violations of the standards normally results in a suspension of clergy or lay persons during the period of investigation. Father Harris has been pastor of St. Bridget’s since May 2015. He also is assigned to the archdiocesan Chancery and Metropolitan Tribunal. 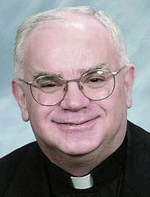 The priest had been pastor of St. Isaac Jogues Parish in Wayne until he was placed on administrative leave in 2011 as part of a sweeping investigation by the archdiocese into past allegations of ministerial conduct. He was reinstated after allegations against him were determined to be unsubstantiated. Anyone wishing to make a report of child sexual abuse may call Pennsylvania’s Child Line at 800-932-0313. For a report of a violation of the standards of ministerial behavior, contact the archdiocesan Office for Investigations at 888-930-9010. Learn more information here. The injustice to Father Harris reaches to heaven and attests to the anti-Catholicism of society at large and within the Catholic community of those who have a hidden desire to put down a Catholic priest.